Try this delicious Tiramisu recipe for your next dinner party! You don’t have to be Italian to enjoy this luscious coffee-flavored dessert with a bit of something extra from a little liqueur. Made with just a few ingredients, this stunning dessert is always a welcome ending to a delicious meal. 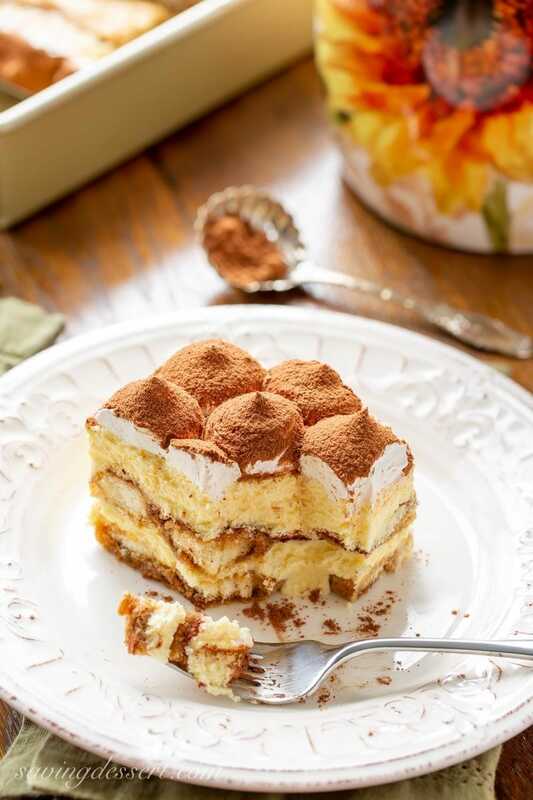 We love this Tiramisu recipe any time of the year. You don’t have to rely on in-season fruits or special equipment to pull it together. And, this is not a complicated dessert to make. There are a few steps to whip it up, but we go through each and every one with simple, easy to read directions. And no need to worry, this recipe has been well tested, tweaked, and tested some more. I’ve always loved the flavor of the Tiramisu I’ve tried over the years. In addition to tasting great, I wanted my version to slice beautifully but still be fluffy, creamy, rich and soft. One of the goals I had while developing this recipe was to make a Tiramisu that holds together well. This recipe is all that and much more than a trifle in a pan. Each layer can stand on its own with plenty of moan-worthy flavor and “pick-me-up” attitude. 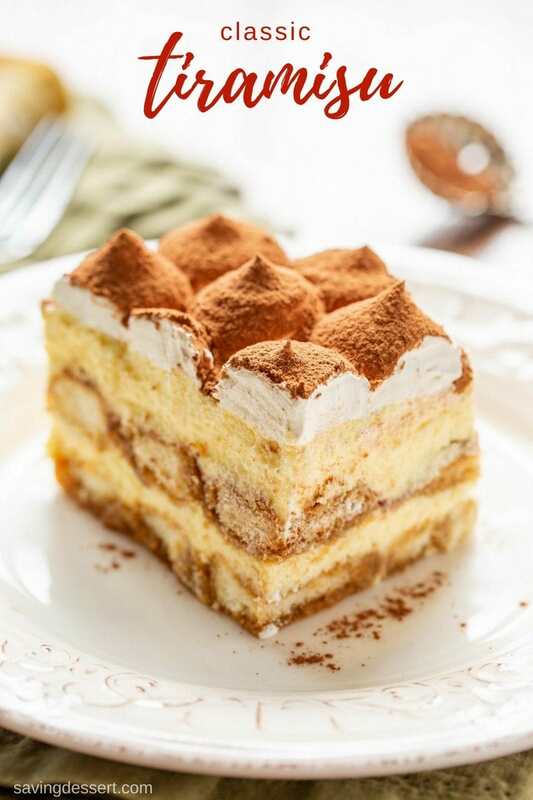 Tiramisu actually comes from a Venetian word that means “pick me up”, “cheer me up” or “lift me up” and it does all that! The first original Tiramisu recipe doesn’t include liqueur and you can leave it out if you prefer. Also, some people use a sweet Marsala wine or rum instead of coffee liqueur. I love the taste of Kahlua, and coffee, so it’s a win-win for me. There’s a lot of disagreement about where the first Tiramisu recipe came from. One thing is for certain, it didn’t exist in cookbooks prior to the 1960’s. I researched numerous recipes as the basis for this dessert. My favorite overall comes from Chef Dennis Littley. 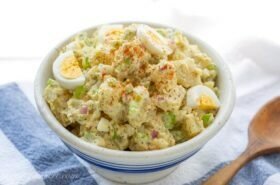 He has some amazing recipes on his blog – A Culinary Journey with Chef Dennis. Check it out! A luscious coffee-flavored dessert with a little something extra from the Kahlua liqueur. Fill a medium saucepan about 1/2 full of water. Bring to a boil, then reduce the heat to low. Prepare a 9x9-inch square pan or other casserole type container with 3-inch sides. Place the egg yolks and sugar in a heat-proof bowl and whisk to combine. The mixture will be very thick. Place the bowl with the eggs over the hot water, creating a double boiler. Don’t allow the bowl to touch the water. Cook the eggs and sugar while whisking constantly, about 7-8 minutes or until thick. Remove from the heat. Dollop spoonfuls of the room-temperature mascarpone into the yolk mixture and stir with a rubber spatula to combine. Continue adding the mascarpone until all is incorporated. Add the vanilla and blend. Combine the coffee and Kahlua in a shallow bowl. Dip the lady fingers, one at a time, into the coffee mixture, turning them over to coat the other side, then arrange in the bottom of the prepared pan. They should be touching and not overlapping. Dip each cookie quickly, counting “one-thousand one” then turn and county “one-thousand two”. This is just long enough to soak the outside of the cookie without making them mushy. Spoon half the custard over the cookie layer. Repeat with another layer of lady fingers and the remaining custard. Refrigerate at least 8-hours or overnight for best results. (Topping is optional) When ready to serve, beat the whipping cream and powdered sugar until stiff peaks form. 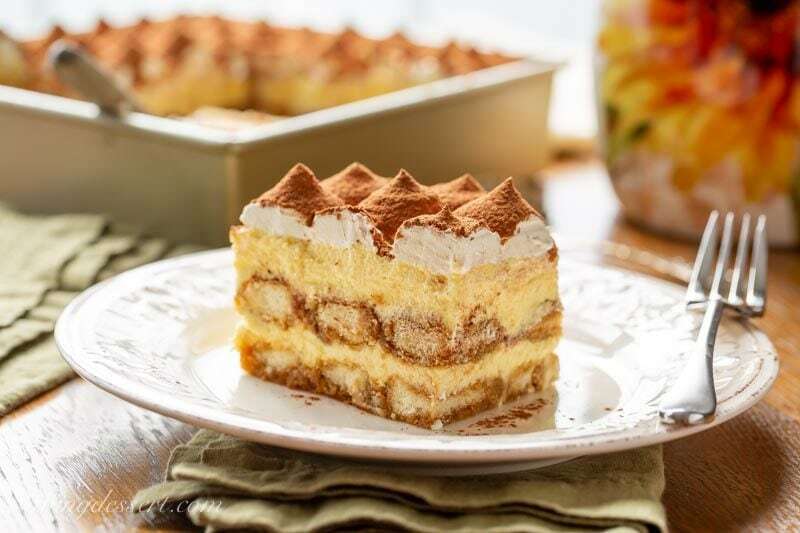 Top the Tiramisu with the whipped cream by pipping on top using a plain, wide decorating tip. Sift cocoa powder over the top to cover. Serve and enjoy! 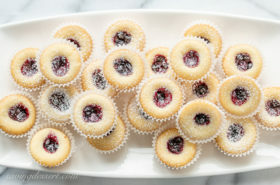 We love make ahead desserts, especially when we’re having company, or our monthly family dinner. Here are a few more of our favorites! For your summer parties, try these Strawberry Cheesecake Bars. 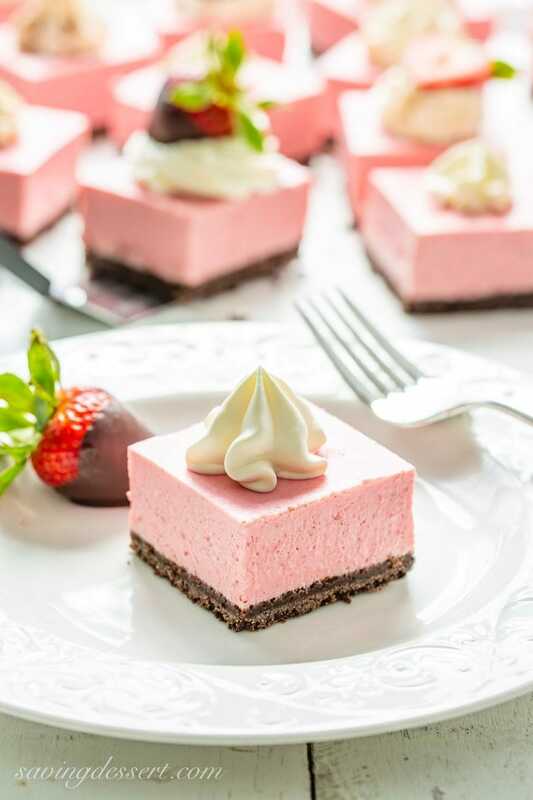 They’re creamy, refreshing, and lightly sweet with an intense strawberry flavor making these deliciously crave-able and perfect for all your summer get-togethers! 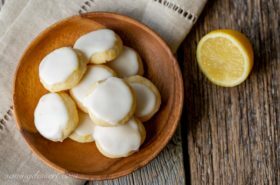 Don’t miss our Easy Lemon Posset recipe too. 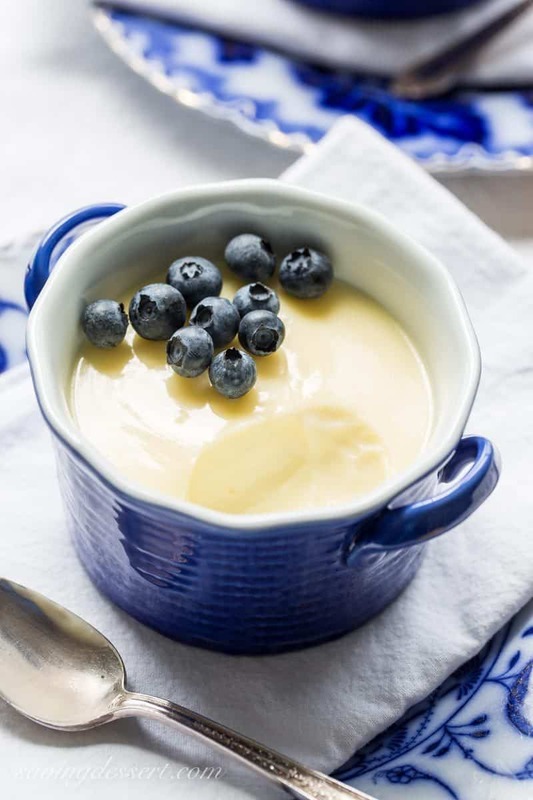 It’s a cross between a lush pudding and a silky lemon curd, this amazing English specialty is made with just three simple ingredients. 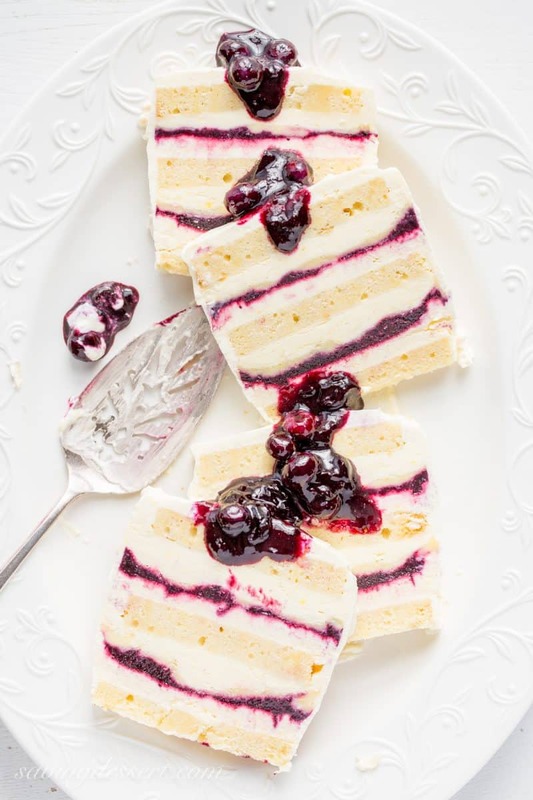 Our Blueberry-Lemon Icebox Cake is made with tender pound cake layered between fluffy lemon curd mascarpone cream and a fresh blueberry sauce for a wonderful frozen dessert you’ll be thrilled to serve your guests. 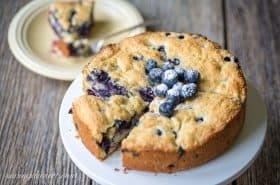 There is no link to the recipe…Help! Hi Melissa. The printable recipe card is just above the box where you leave comments. It’s the last thing in the post, and is shaded in beige. 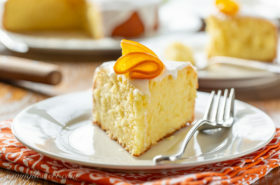 Enjoy this delicious recipe – it’s a fantastic dessert! My tiramisu ever looked as beautiful as yours, Tricia! I love how you piped the topping before the cocoa dusting. So beautiful! I love coffee and that’s probably why the espresso and kahlua flavors have always attracted me to this dessert 🙂 Well done! I bet it does Susan! Thanks so much. This is my husband’s favorite. Looks like you nailed it with the perfect recipe! Thanks Jennifer – Kahlua is a nice touch in this creamy dessert. What a perfect classic! Wish I could have a small bite now….thumps up for you, Tricia. 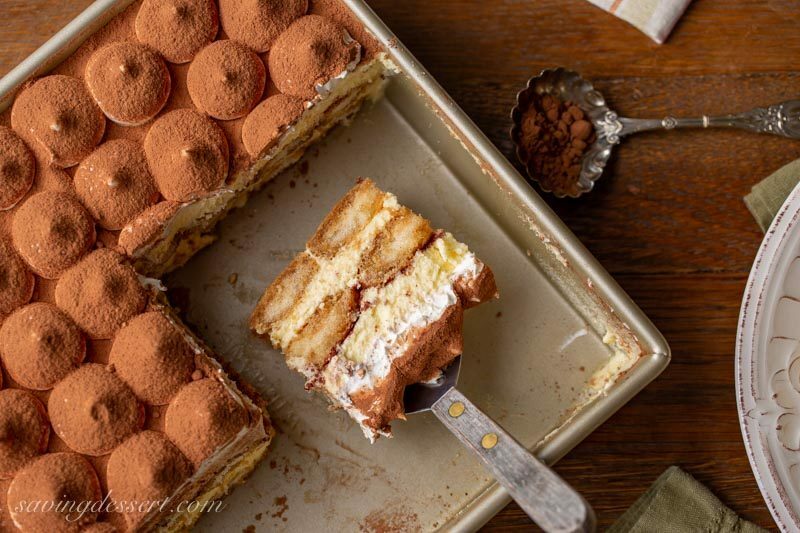 You really perfected tiramisu Tricia and made it look like a beautiful cake. We should all come over and have tea with you. Pinned! When are you going to invite me over, I want to dig a fork into this so badly! I’ve always wanted to do tiramisu topping like that ~ gorgeous! Anytime Sue – you don’t need an invitation 😉 Thanks – happy weekend! This looks like something you’d pay $10 for 1 little piece at a fancy restaurant. I love it! Thanks Chris! We love it too – and I’m embarrassed to say how many times I’ve made this recipe – haha.